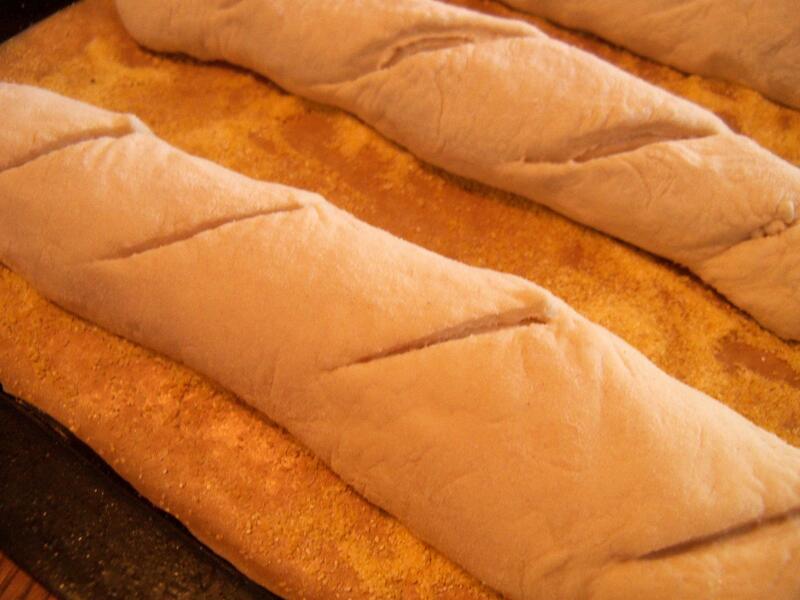 Yesterday I had the entire day free so I decided I would try making a new bread…simple enough right? noooo! 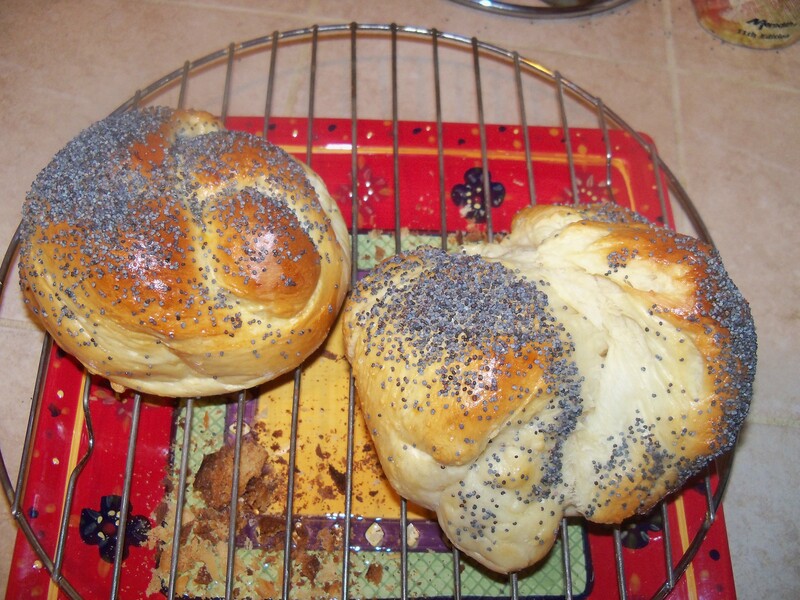 Challah bread was a challenge! 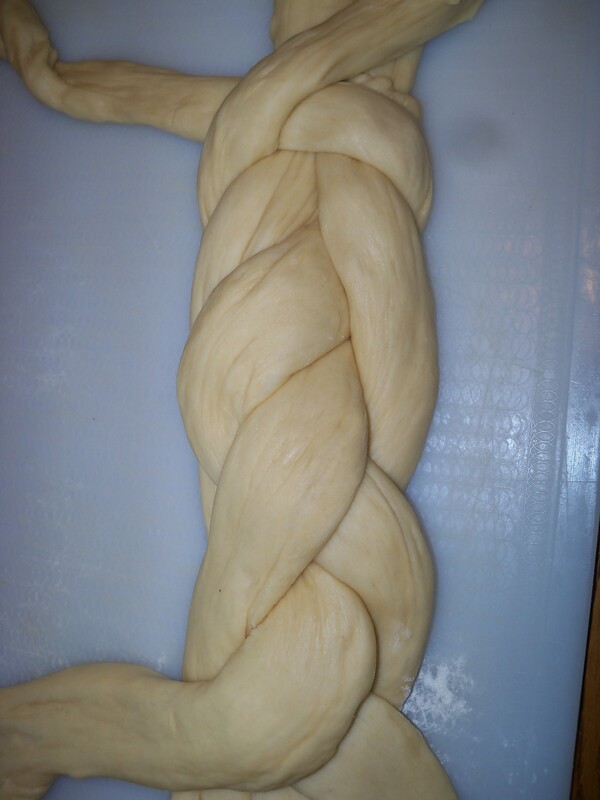 Not making the dough but braiding the dough. 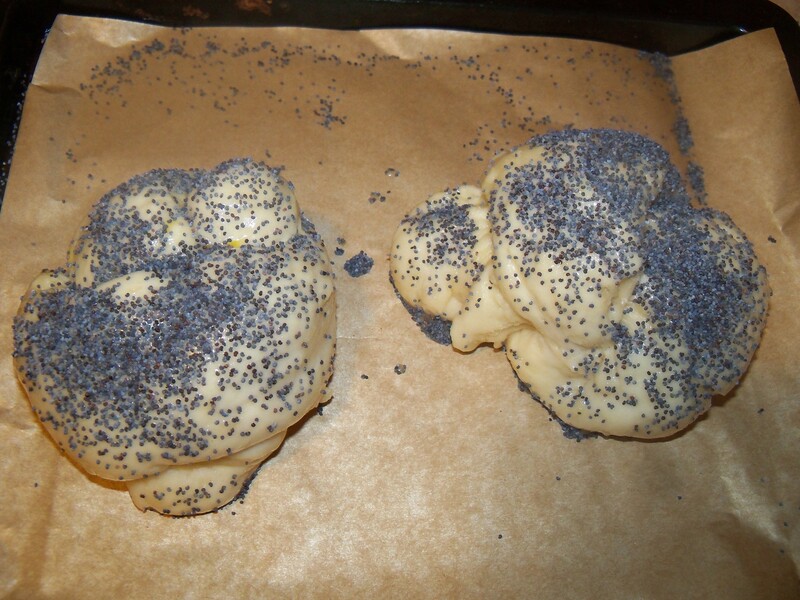 I have made pretzels a million times and bread with twisted tops but never something like this. 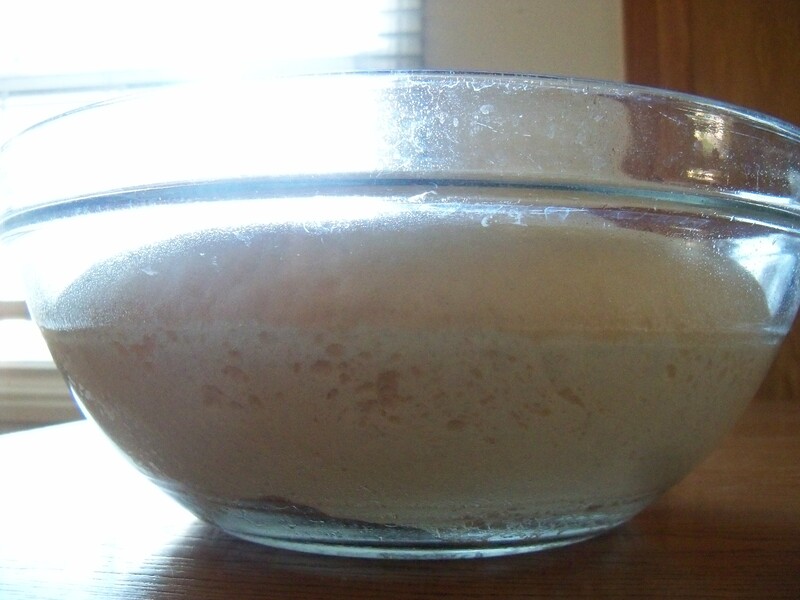 Start by dissolving the yeast in warm water and let stand for about 5 minutes. 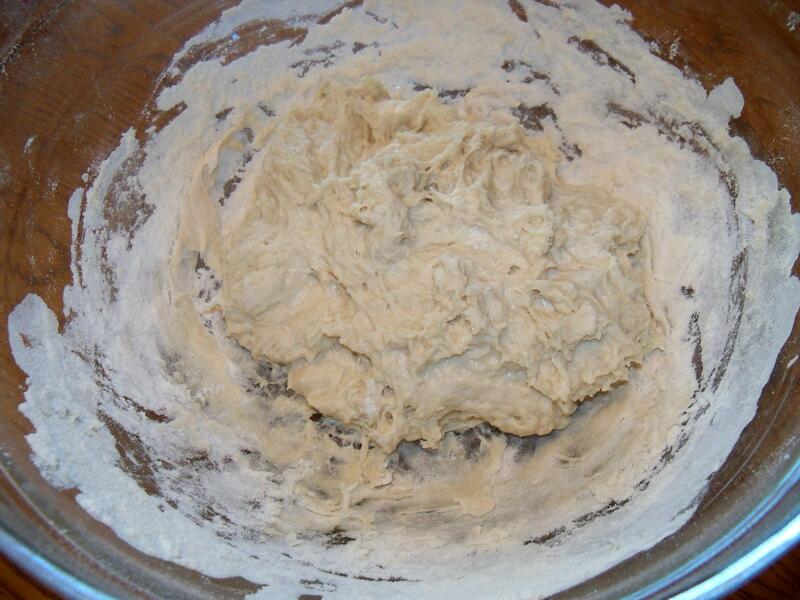 Use a wooden spoon to stir in the sugar, 3 eggs, 4 1/2 cups of flour, salt, and the butter until the dough comes together. 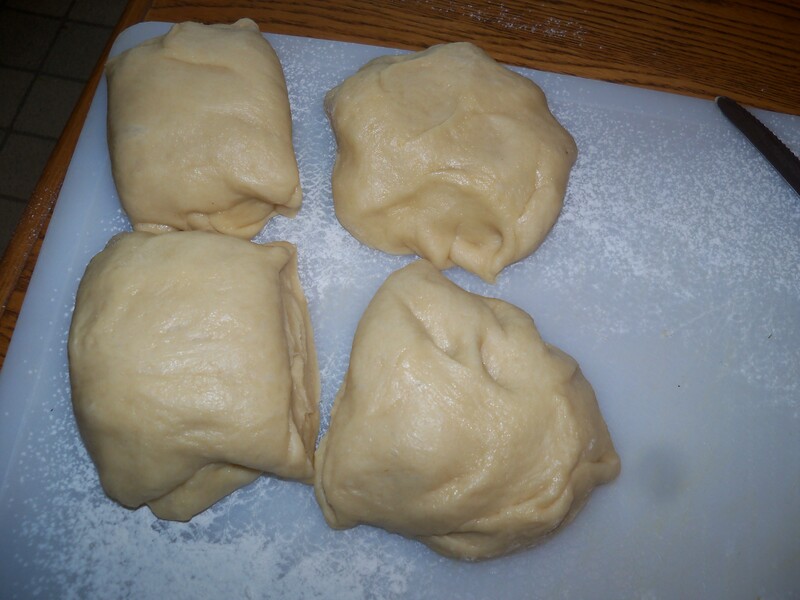 Turn the dough on to a lightly floured surface and knead, working in the remaining flour as necessary to keep the dough from being too sticky, until the dough is smooth and elastic (you can pull the dough without it breaking off and everything’s worked in) around 7 minutes. 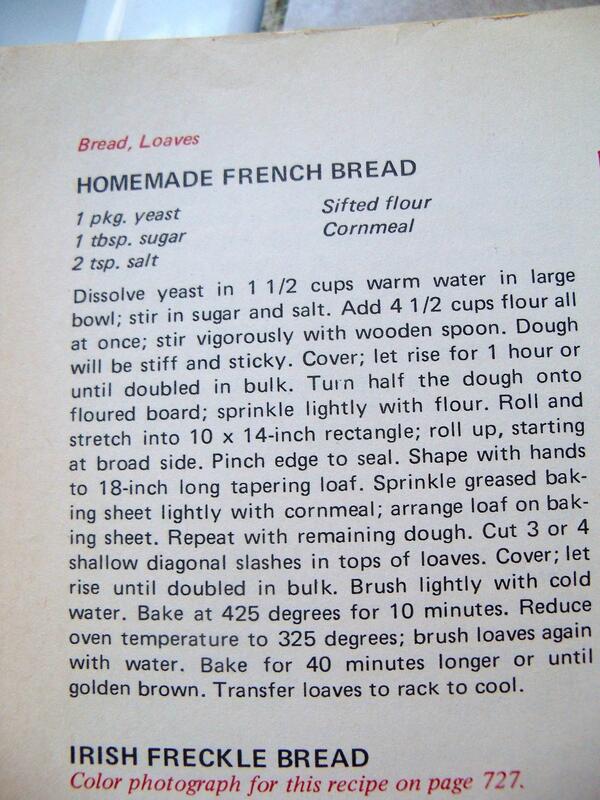 Do not add to much flour. 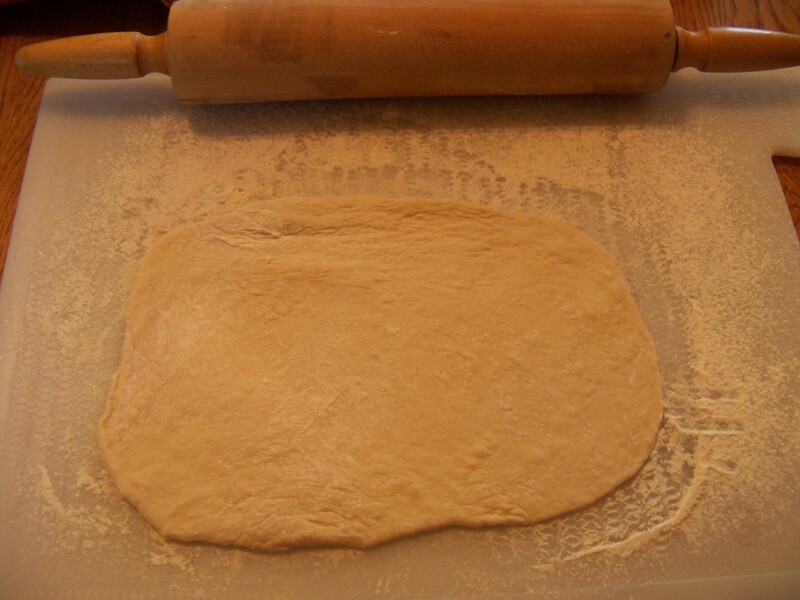 The dough should stay soft and will become less sticky with kneading. 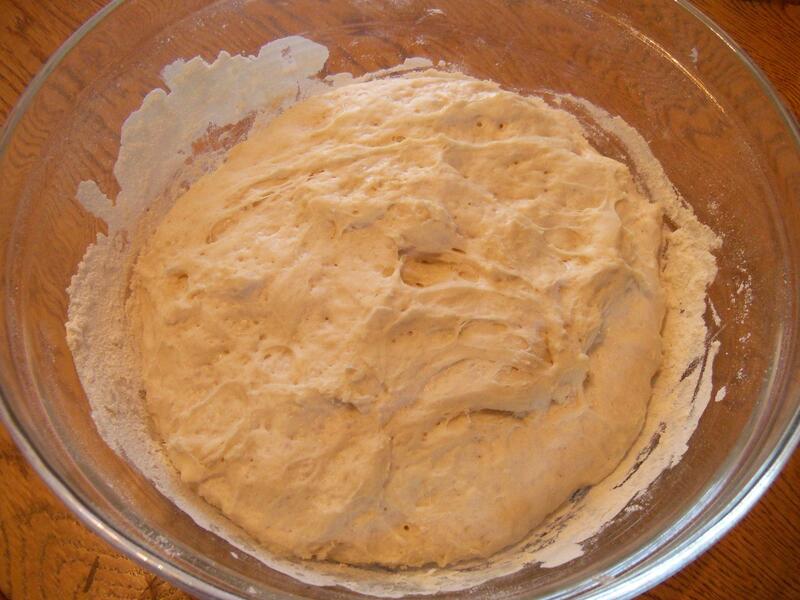 Form the dough into a ball and place in a lightly oiled bowl. 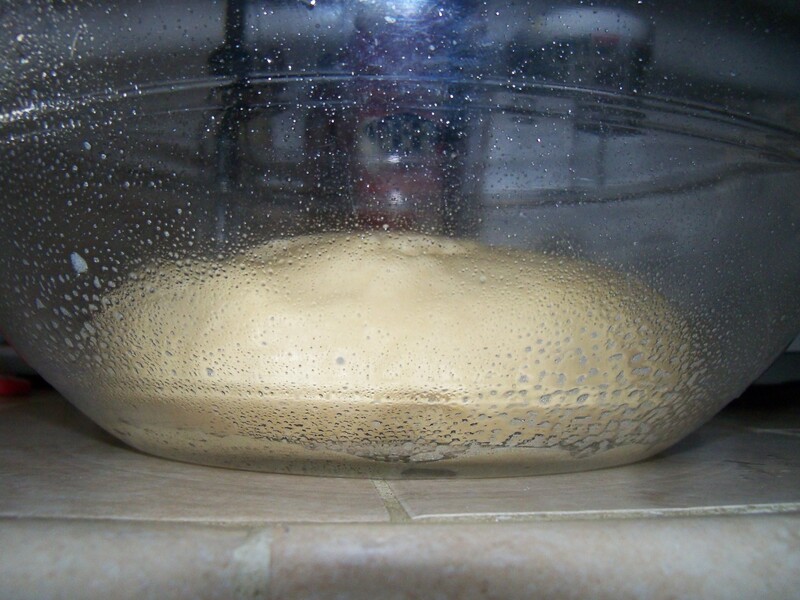 Cover the bowl with a damp kitchen towel and let the dough rise in a warm spot for 2 hours until its doubled in size (I always let my dough rise in the microwave). and using your palms start in the center and working outward, elongate 1 piece by rolling it gently against the work surface with even pressure until you have formed a rope as long as the prepared pan. Repeat with the remaining pieces. And this is where it gets difficult..
Line up the 4 strands in front of you horizontally, Cross the strand farthest from you across the other 3 strands so that it is now nearest you. Then cross the strand that is now next to it across the other 2 strands away from you. Position the outside strands so that they are away from the center ones and position the center 2 strands perfectly horizontal. Bring the strand nearest you down between the 2 horizontal strands. Bring the strand farthest from you up and across the opposite side. Again, bring the strand farthest from you down between the 2 straight strands. Bring the strand nearest you up and across to the opposite side. Starting from the strand nearest you, repeat the braiding until you reach the ends of the ropes. 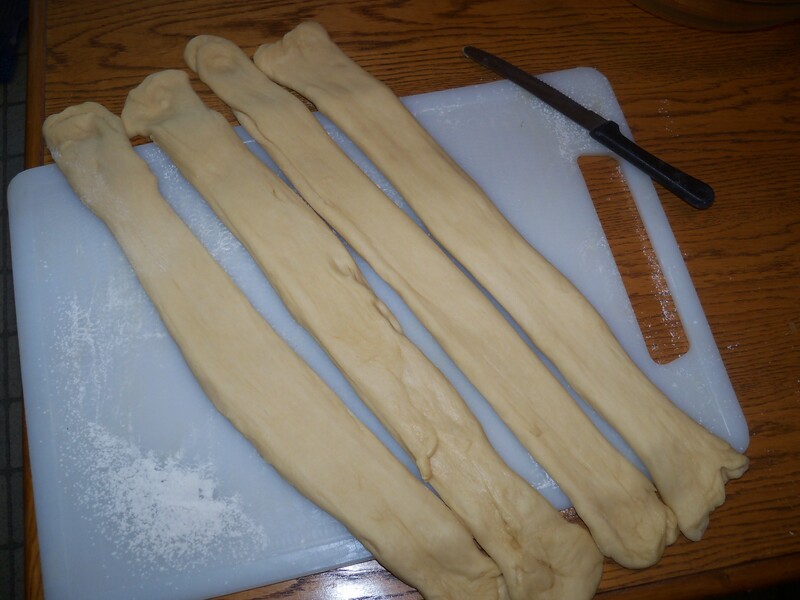 Pinch them together and at the bottom and tuck the strands under at the ends. 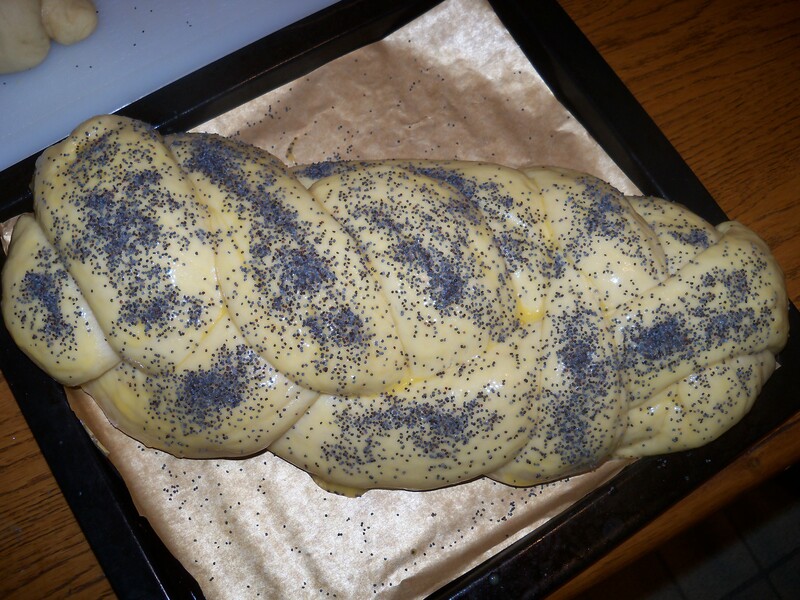 Place the braided loaf on the prepared pan and cover and let rise again for about an hour until it doubles in size, and is spongy to touch. 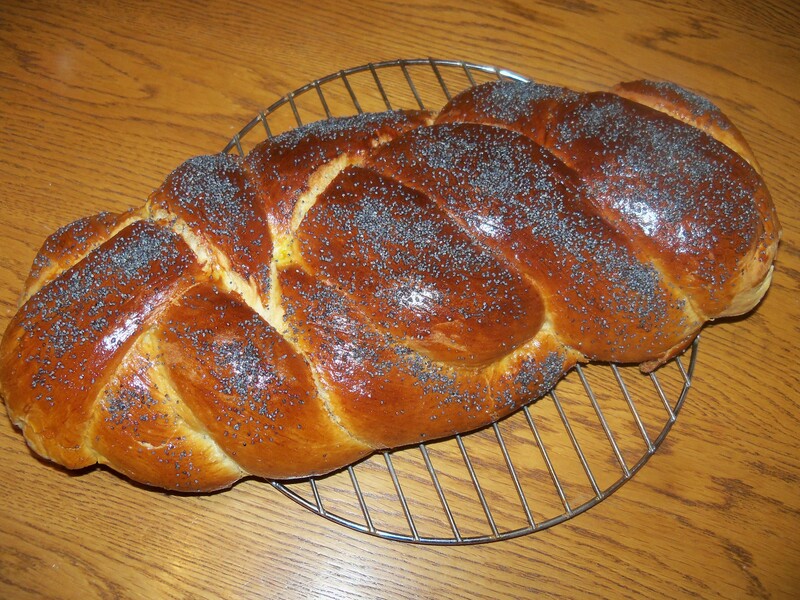 bake the braid until it is nicely brown and sounds hollow when tapped on the bottom. 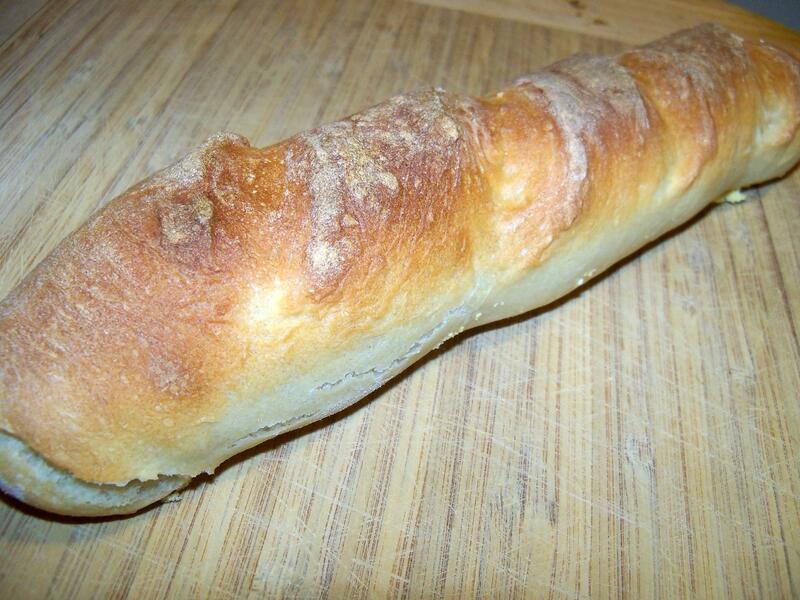 After 30-35 minutes take out let cool on a wire rack..wait about 15 minutes before cutting in so your bread doesnt dry up. 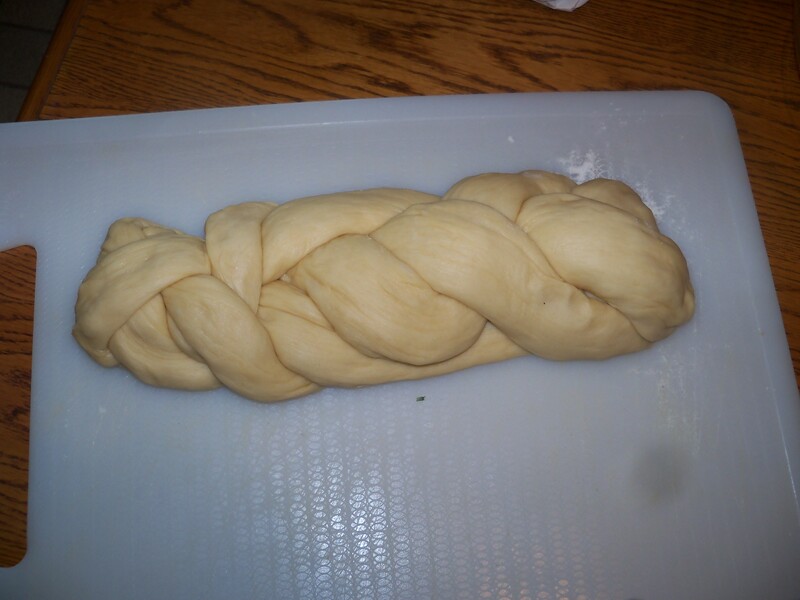 Before I tucked the strands under the loaf I cut off some excess and used it to make some knots that came out beautifully after 25 minutes in a 350 oven. If your bread does start to brown and get dark too early just cover it loosely with aluminum foil and continue baking…I had to do this with mine. 🙂 I hope you all continue to have an awesome week! !